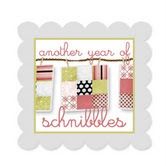 Cupcakes 'n Daisies: Christmas in July . . . .
Have you been wondering what to make with that lovely bundle of Sentiments by 3 Sisters for Moda fabric you bought? Or worse yet, not bought that line of fabric because you didn't know what to do with it? Well your troubles are over! This is Amaryllis designed by Monique Dillard for Open Gate. 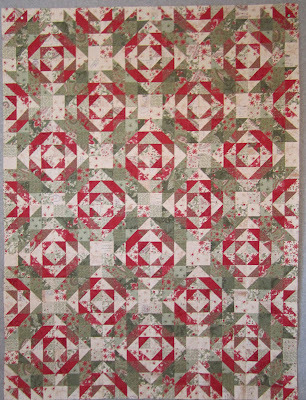 The quilt on the pattern cover was made using Sentiments. I know because I pieced it, way back in April, when Monique was getting ready for market. The fabric has a wonderful vintage romantic feel that I fell in love with. Don't like Sentiments, you only need 8 fat quarters of one fabric, 8 fat quarters of a contrasting fabric and 8 fat quarters of a background fabric to piece the blocks. Add less than 2 yards for the border and you've got this quilt. This pattern is made up of blocks that look hard but are not. There are a few half square triangle units involved but I love hsts, I always make them bigger then square them up. Every now and then someone will leave a comment saying they avoid quilts that use hsts, I don't know how they do it, some of my most favorite quilts are made entirely from hsts. 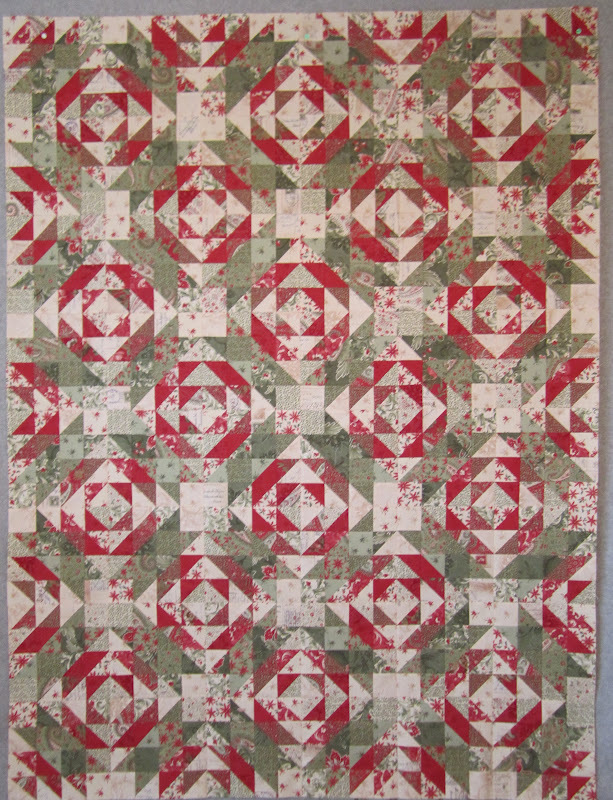 Here's a close-up of the pieced blocks. The pattern for Amaryllis should be available in your local quilt shop, but if it's not, you can buy it online here. It has approximately 1,352 pieces. It looks lovely Thelma!! Thanks for letting us know about the pattern ... looks great!! GORGEOUS!! 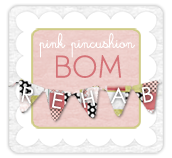 Im glad I popped in on your blog and didn't miss this one! Lovely! You do beautiful piecing. No wonder your quilts are showcased so often. I'm so happy you're willing to share them all with us. That is so pretty Thelma. I can certainly see that over the back of your red couch during the holidays! Amazing what can be done with so few fat quarters. Thelma, I think you have a new career making quilts for pattern covers! This one is lovely! I like the colors/fabric. Definitely amaryllis-like from the colors to shapes of the blocks. Congratulations on yet another "special mission" stunt sewing achievement Thelma! It is a beautiful quilt. Love this quilt! So amazed you're able to post something nearly every day - yet you have these special projects going on you say nothing about! This is a beautiful quilt and perfect line!